Elma, WA, Feb. 23, 2014.....Eight men with outstanding auto racing credentials will be recognized as The Elma Auto Racing Hall of Fame Class of 2014 in a ceremony on March 15, 2014. 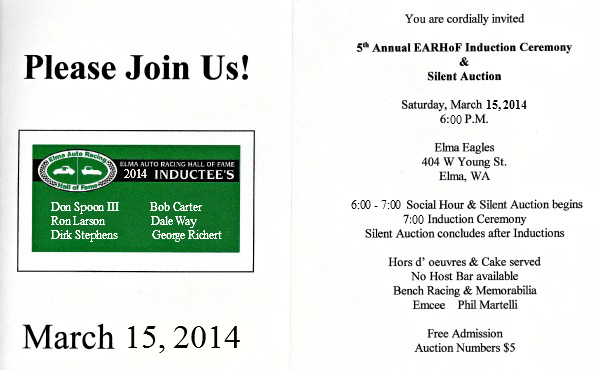 The 6th Annual EARHoF Induction Ceremony and Silent Auction will be held at the Elma Eagles Hall in Elma. Montesano’s Bob Carter was one of the original pioneers of auto racing in Grays Harbor and was one of the top competitors at the Evergreen Speedway in Central Park and then at the Grays Harbor Fairgrounds when racing moved to the new location in 1957. Carter who unfortunately passed away in 2013 before receiving his recognition from the EARHoF, joins his brother Howard a 2010 Inductee in the EARHoF. Despite going through the fence in his first ever race at the Southwest Washington Fairgrounds in Chehalis, George Richert forged a successful auto racing career. Building and owning his own cars, the 1972 EARA Jalopy Champion from Shelton found victory lane at most every track on which he competed. 1972 found Shelton’s Dale Way turning his interests from drag racing to crew chief duties in circle track racing by helping Vic Wright. In the early ‘80s he began a successful tour with Tom Williams that led to 3 championships. Way’s motors and innovations have been found on more cars then he can remember. His involvement continues today with GHR modified racer Kris Asche. Don Spoon III began racing the B-modified class at Elma in the mid ‘70s. Success soon found the the Wynochee Valley resident switching to sprint cars racing at Skagit Speedway and other west coast venues. Returning to Grays Harbor Raceway Spoon won the 1989 Limited Sprint title. An accomplished engine builder and machinist, Spoon has helped many racers through the years. Spoon is the nephew of Inaugural EARHoF Inductee Larry Spoon. Elma’s Ron Larson claims the last Super Stock Championship on the ½ mile track in 1979. In 1980 Larson’s attention turned to helping construct the 3/10 mile speedway. He learned to operate the earth moving equipment and donated fuel and his time in getting the new track built. When racing resumed in 1981 Larson was competing in the open wheel limited modifieds and was the 1981 Rookie of the Year with 2nd place point finish. Larson returned to drag cars and can still be found competing in the straight liners. Despite having a father and uncle who were involved with racing in the ‘50s and ‘60s, Dirk Stephens of Olympia didn’t have much to do with it until starting in the Hobby Stock Class on the 3/10 mile. Almost immediate success led to the 1982 Hobby Stock Championship propelling Stephens to success on the NASCAR Northwest Tour. Stephens’ moved east and raced the NASCAR Busch (Nationwide) Series and had starts at the Cup level. He eventually returned to the Northwest and can still be found racing late models at South Sound Speedway. The prestigious Larry Spoon Distinguished Service Award for 2014 will be presented to Herman Burns. The driver and championship car owner who lived in Hoquiam was the type of racer who would give you a part of his own car keep you running. He was one of the first to be there and one of the last to leave. Burns was an innovator and used what he had available to keep his cars and those of others racing. His positive attitude and never say die efforts were an inspiration to those around him. Now living in Missouri, Burns plans to attend the ceremony. The final award, the Fred Brownfield Exemplary Contribution Award will be announced the evening of the ceremony. The winner is a man well known and respected by racing fans and is expected to be a popular choice. In a special presentation, 2012 Inductee Wendy Peterson will be re-acknowledged. At the time of the 2012 ceremony the EARHoF had not been able to contact Peterson’s family. Mr. Peterson’s granddaughter just recently contacted the EARHoF and plans to be in attendance to receive her grandfathers award. The Elma Eagles Hall can be found at 404 W Young St. in Elma. Activity gets underway at 6:00 P.M. with the silent auction and a social hour. Photos, videos, and other memorabilia will be on display. Hors d’oeuvres, cake, coffee, and soft drink will be served. The Induction Ceremony will begin at 7:00 P.M. Admission is free. Those wishing to bid in the silent auction will need to purchase an auction number for $5. The Elma Auto Racing Hall of Fame is a volunteer non-profit organization dedicated to honoring and preserving the auto racing heritage of Grays Harbor Raceway. All proceeds and donations are used to help reach the EARHoF’s mission. Information on the EARHoF can be found at http://elmaautoracinghalloffame.webs.com. Looks like a good group of inductees. Always a fun event to attend to get some good bench racing in before the start of the season. Hope the lights stay on this year. Confirmed today that Steve Beitler, Promoter/General Manager of Grays Harbor Raceway will speak at the Induction Ceremony. It's going to be a great night; Honoring the past, Living in the present, and Planning for the future. Just what the EARHoF is all about. Mark your calendar for March 15th and plan on attending. We'll also have around 50 items in the silent auction.